Moltin's heading to The Venetian in Las Vegas today, ahead of Shop.org 2018. Get your hands on a cool pair of Stance socks for free at our booth! At Moltin, we are reinventing commerce. To show you how, we're inviting you to come along and visit us at booth SZ5 where you can experience the future of retail for yourself and your customers and score yourself a free pair of Stance socks. 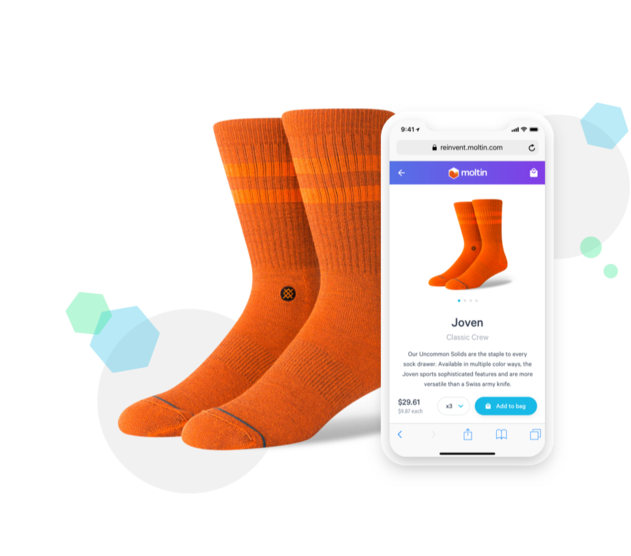 We recently partnered with Stance who, in just 8 weeks, launched a first-of-its-kind app-free mobile self-checkout powered by Moltin to reduce check-out lines and deepen brand engagement. While you stop by, experience the simplicity of the self-checkout for yourself. Click below to reserve your pair of Stance socks. Stop by our Shop.org booth, SZ5, to pick them up and learn about the future of app-free self-checkout. Be the envy of your friends and colleagues.